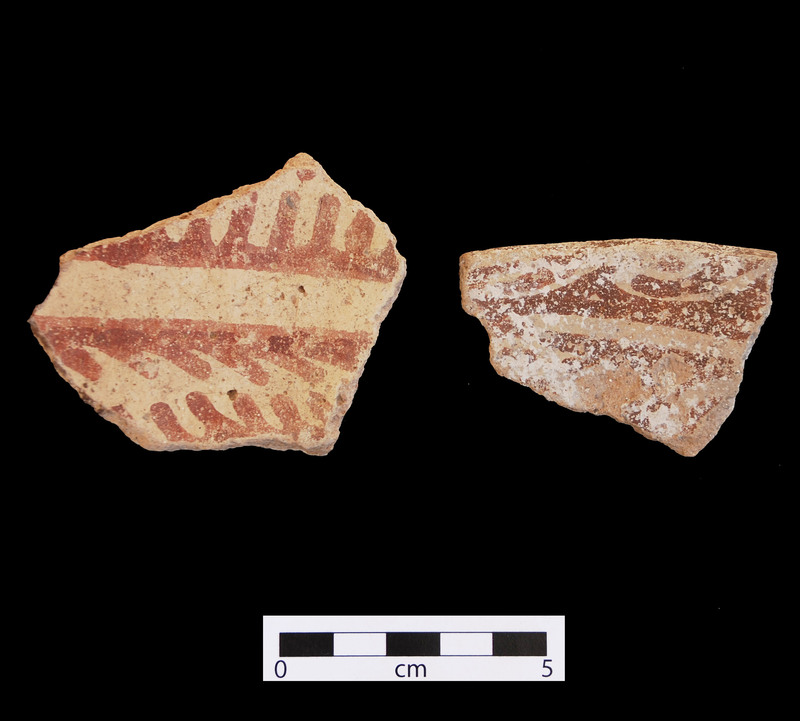 Gila Butte Red-on-buff sherds. Click the image to open the Gila Butte Red-on-buff gallery. Gila Butte Red-on-buff is a type of Hohokam Buff Ware found primarily in the middle Gila River Valley, into the lower Salt River Valley, north to the Tonto Basin, and south as far as Hodge Ruin in the Tucson Basin. Date Range: ca. A.D. 750-850. Firing: In a neutral to oxidizing atmosphere; fireclouds common. Surface Finish: Muscovite mica is plainly visible on vessel surfaces; slipped and polished; sometimes lightly incised; sometimes porous. Paste Color: Gray (early); surface color typically light brown, gray-brown, gray, or orange, and less commonly tan, yellow-white, or white. Forms: Bowls with flaring rim, jars, scoops, plates, censers, effigies. Late Gila Butte vessel forms include globular jars with short flared rims; flare-rim bowls with shallow, flat bottoms; and outcurved bowls with shallow, flat bottoms. Design: Capped fringe; design ticking; pendant dash motif; keys and flying birds; life-forms and life-form borders; all-over layouts with small elements spiraling from bowl centers and around vessels in parallel bands; full-field negative design without hachure-fill; interlocking scrolls also common; multiple trailing lines on bowl exteriors. Early Gila Butte Red-on-buff has hachured pendant triangles of other full-field designs on exterior bowl surfaces, large solids, and thick serrated lines; fringed curvilinear scrolls, crenulated lines, free-floating fringe, quail, and other life forms, slanted railroad tie hachure, and all-over, spiraling, small element designs are late. Incising: Shallow incising common; discontinuous; lines overlap and resemble scratches rather than grooves. Key Traits: Scrolls with pronounced serrated edges; life forms with hatch-filled bodies; shallow incising; keys; tick-marked rims; trailing line spacing <3 cm at rim. Comparisons: Earlier types are denser, lacking pores, and later types are generally more porous. Gila Butte Red-on-buff lacks the complex hachure-filled designs and deep, regular incising common to earlier types. Santa Cruz Red-on-buff designs also spiral, but small elements are more frequent than on Gila Butte vessels, and incising is rare. Hachure-fill is also essentially absent in Santa Cruz vessels, as are life-form borders.